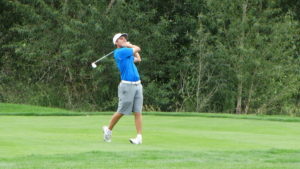 Bremerton, WA -Â Wyoming menâ€™s golf concluded the 2018 Mountain West Championship on Sunday afternoon, tying for fifth with a team total of 882 (+18). The finish is the highest for the Cowboys since 2002, and ties the best conference championship result in the Mountain West era. Junior John Murdock stepped up on the final day of the tournament to lead UW with a round of 71 (-1). It was his lowest score of the three days and brought him to +8 for the tournament and tied for 25th. Senior Drew McCullough and sophomore Dan Starzinski each wrapped up their weekend with a round of 76 (+4). McCullough finished +4 overall and tied for 17th, while Starzinski was just one stroke back at +5 and tied for 21st. Senior Arron Lickteig added UWâ€™s final counted score with a card of 77 (+5). Senior Glenn Workman struggled down the stretch, going four-over par on his final four holes to record a round of 78 (+6). However, he still logged an impressive finish, tied with McCullough for 17th. UNLV claimed the team title with a score of 856 (-8), 11 strokes better than second-place Colorado State at 867 (+3). Nevada moved into third on the last day and finished with a total of 875 (+11). The Rebelsâ€™ Shintaro Ban secured the individual title by nine strokes, finishing with a score of 200 (-16). The Cowboys will now wait for the NCAA selection announcement on May 2 to find out if their season will continue at the NCAA Championships.